This month [November 2013] marks the seventy-fifth anniversary of Kristallnacht—literally “Night of Crystal,” but more often “Night of Broken Glass.” On November 9–10, 1938, the German Nazi Party carried out a pogrom, during which ninety-one Jews were killed, 26,000 men were sent to concentration camps, and the confiscation of Jewish property was accelerated. 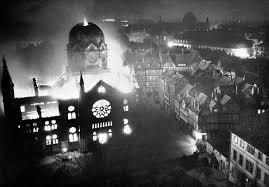 Over 250 synagogues were destroyed, many burned to the ground. The name of the tragedy came from the shattered glass from homes and Jewish-owned businesses that littered city streets. Although Kristallnacht is regarded as the most dramatic turning point yet toward the horrors to come, the carnage was long in the making. One American observer, the journalist Vincent Sheean, was in Europe when France, the United Kingdom, and Italy agreed to the September 29 Munich Pact, ceding to Germany the Sudetenland, the name for the Czechoslovakian borderlands inhabited primarily by German-speaking residents. During the month that followed—but before Kristallnacht—Sheean traveled around by train and car and wrote “Aufenthalt [Delay] in Rosenheim,” describing the dismay he felt as a witness to the increasing persecution of Jewish residents throughout German-occupied territories. Somewhere in the mystery of mass suggestion the answer could be found, and can someday be analyzed upon dead material by the psychologists of the future. Now that the material is living, it is almost impossible to trace the process of transformation. * Nuremberg Document 3063-PS (Walter Buch, Nazi Party Supreme Court chief, to Hermann Göring, February 13, 1939). Notes: On page 11, Sheean summarizes from memory passages from the memoirs of Bernhard von Bülow, the German imperial chancellor under Kaiser Wilhelm II, 1900–09. On the last page, he recalls a day in early October, after the Reichswehr (the word used until 1935 for the German armed forces) had occupied the “third zone”—one of four zones in the Sudetenland ceded to Germany by the Munich Pact. The car broke down not far beyond Siegsdorf on the Reichsautobahn to Munich—the great Reichsautobahn which is the most beautiful of all German motor roads, since it leads to the home of the Führer. . . . If you don't see the full selection below, click here (PDF) or click here (Google Docs) to read it—free!